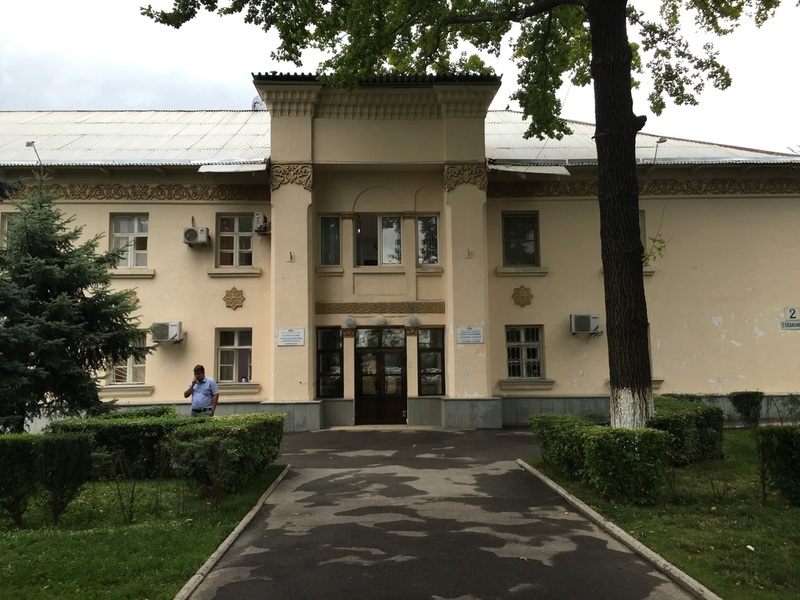 Real quick: if you have an Almaty layover for five or more hours, this guide isn't for you. You should grab a map from the tourist information booth, get a taxi (2,000 tenge) or Bus 79 or Bus 86 (80 tenge) to the center and visit the Green Bazaar, Ascension Cathedral, and Kök Töbe. To catch a taxi, avoid the freelancing taxi drivers who will exploit you and go to the one of the taxi stalls for Eko Taxi or City Taxi in the lobby right outside the baggage claim. To catch a bus, walk out the door, follow the cars out of the small parking lot and past the toll booths, and walk two blocks down the street to the bus stop. This may be the only time you're ever in Kazakhstan, so don't spend it sitting in the tight little terminal! Almaty International Airport (ALA) is special because it's not isolated, surrounded by swamps and fields or knotty highways. Right across the parking lot is a quaint village with beautiful architecture, cafes, and things to see. Locals call it, funnily enough, "Airport Village" [поселок "Aэропорт"; posyolok Aeroport], and it is a fun introduction to Almaty for those pressed for time. The terminal you'll fly into is а new thing from the oughts that's nothing to look at, but if you walk out the door of the airport and go to the right, you'll find the old airport right next door, and it's a work of art. 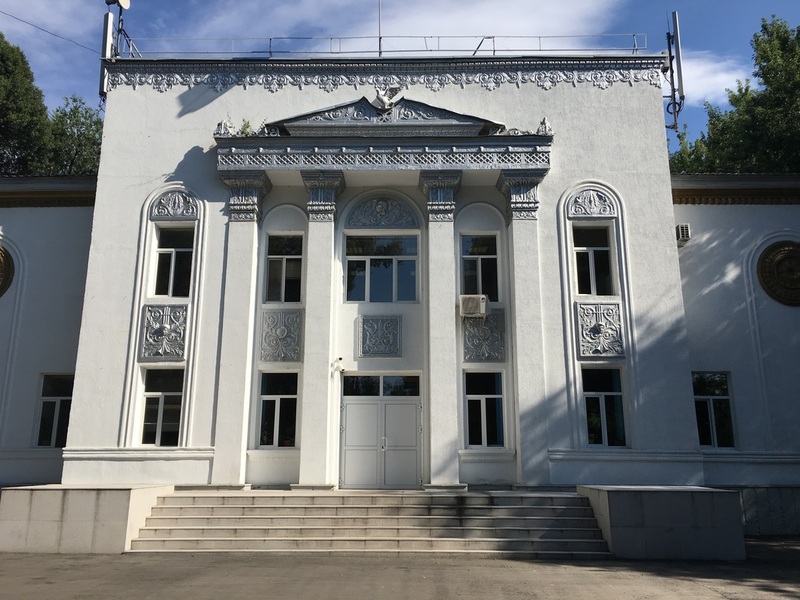 The building was constructed in 1936, and it's built in the so-called "National Style" that was popular at the time in Kazakhstan. This means that its facade features pointed horseshoe arches filled in with the Kazakh ornament called oyu-örnek [ою-өрнек], and it's crowned by a spired cupola that was characteristic of Stalin-era design. Nowadays it's the "VIP Terminal" for those with private jets, so keep an eye out for Kazakh celebrities. If you walk across the small parking lot, to the left of the parking booths you'll see another neat building in National Style, now the headquarters for the airport administration. Apparently, it used to be the airport hotel, though I can't find much information about when it was built and why. Anyways, get up close to enjoy the little details. 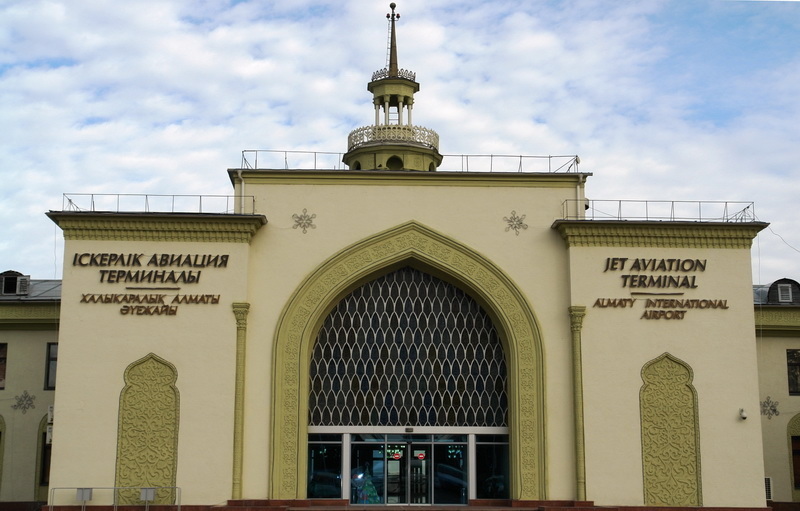 An ornamental ribbon runs under the carved wooden brackets of the eaves, and eight-pointed Islamic stars called Rub el Hizb are spaced between the windows (I suspect these must have been added in a post-Soviet remodel, because they're a fairly explicit religious symbol for an atheist state). Over the main entrance is a false front that's crowned in intricate moulding. This is meant to resemble the infinitesimal niches of muqarna, vaulted ceilings found in Islamic architecture. Isn't this cool! All this and we haven't left the parking lot! When you do finally walk past the toll booths and head down the village's main street, Mailina [Майлина], you'll find rows of pink two-storied apartment buildings, built in 1955 and 1956 for the airport's top brass. If you inspect the plaster ornament running below the eaves, you'll see these digits molded triumphantly by a plasterer of yore. 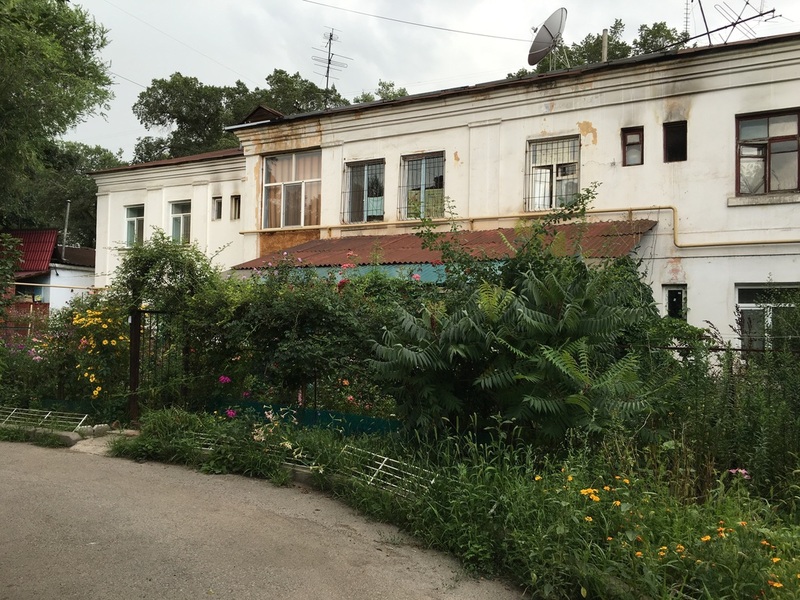 Heading south into this neighborhood, away from Mailina, you'll find about a dozen other buildings from these Stalinist years, some even dating back to 1930. Behind the buildings you can also find creaky wooden sheds, built decades ago to store tools and fuel for each tenant. The courtyards are filled in by tall poplars and oaks, and when the airplanes overhead all find their roost, this becomes a place of quiet. Farther down Mailina you'll find what's called a Palace of Culture [дворец культуры; dvorets kultury]. This was a kind of clubhouse built in the Soviet Union to promote wholesome communist culture, hosting films and discussions and so on. As most airport workers lived in the nearby village, this is where they built their palace. The Aviator's Palace of Culture, as it's called, is the most stunningly-detailed, and fantastically-preserved, of its kind in Almaty, though few locals even know it exists - most zoom by it on their way home from vacation. Look out for the subtle hints of flight, like the birds hidden in the tympana above the windows or the eagle perched on the pediment (or is that a pigeon?). As for all the cherub heads, like the tiny ones creepily lined up along the entablature, perhaps they represent the young aviators who would guide the Soviet Union into the space age, spreading socialism to the stars. The next sight is harder to find. If you head back from the palace a block toward the airport, you'll come to a street called Ogaryova [Огарёва]. Turning right and heading south again, you go about 500 meters before finding a small park. Here is a small square, home to the Memorial to Fallen Aviators. Like every village throughout the former USSR, Airport Village has a memorial to those lost in WWII, an event that traumatized the Soviet Union on an unimaginable scale. 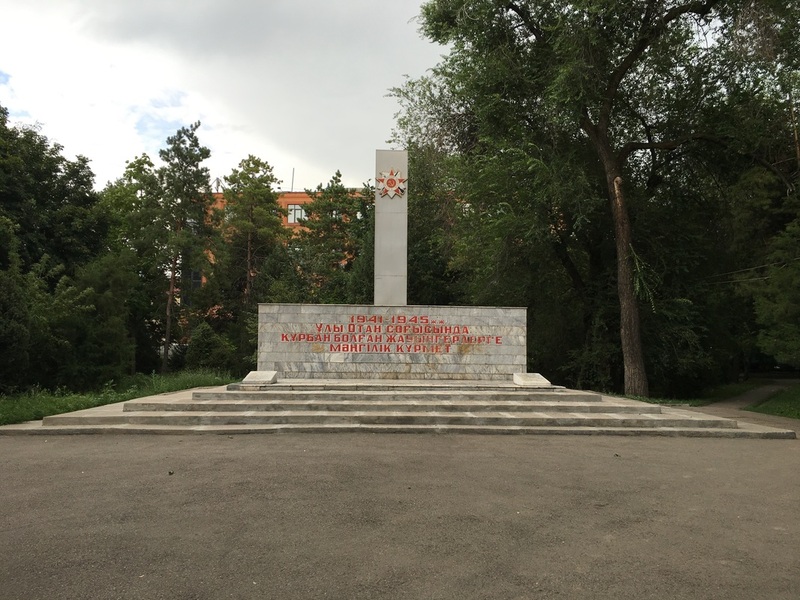 Painted in red on a grey marble wall, a text in Kazakh reads, "Eternal respect to those soldiers who died in the Great Patriotic War of 1941-1945." Two plaques list the aviators who perished, their names listed along with their professions - pilot, navigator, engineer. As its mass concentration of flightworthy males headed for the Air Force, this village must have emptied of men. After paying your dues, notice that the square is surrounded by twelve blocks made of polished black stone, representing the twelve hero cities of the Soviet Union. Hero cities like Leningrad and Stalingrad suffered tremendously. Yet for every big city such as those, there were smaller cities like Airport Village, suddenly devoid of boys, limping quietly out of a war with its new list of heroes. On the way to the war memorial, we passed several rows of small one-story houses. This is the village's chastny sektor, or cottage district. 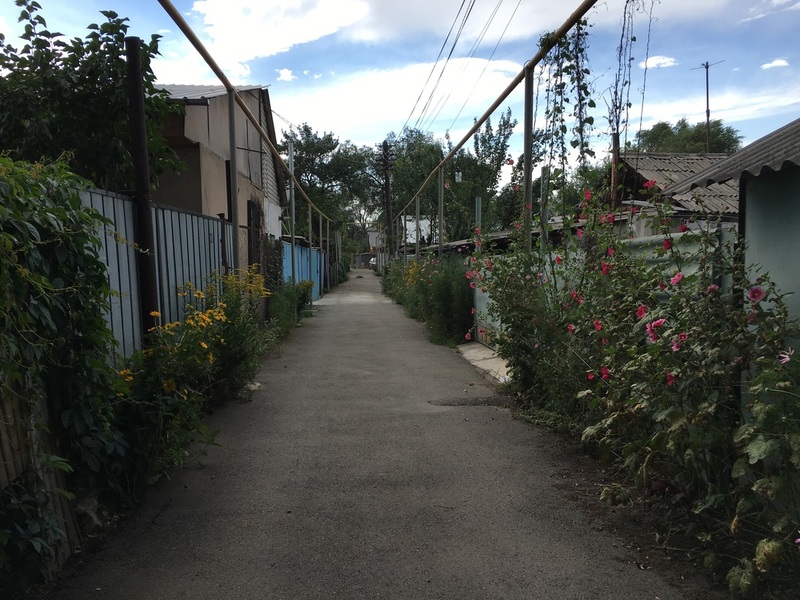 While most people in Almaty live in Soviet apartment buildings, there are still some who live on lanes like these, lined with small homes made of wood or reeds and clay. These structures were almost all built from 1958-1960, during the sixth five-year plan, when Nikita Khruschev initiated a building boom to address the country's housing crisis. The multifamily homes are often guarded by high fences, but the alleyways still feel friendly, full of flowers and fruit trees. Wander around and don't mind the street dogs - they're more afraid of you then you are of them. After a long walk, you must be famished! 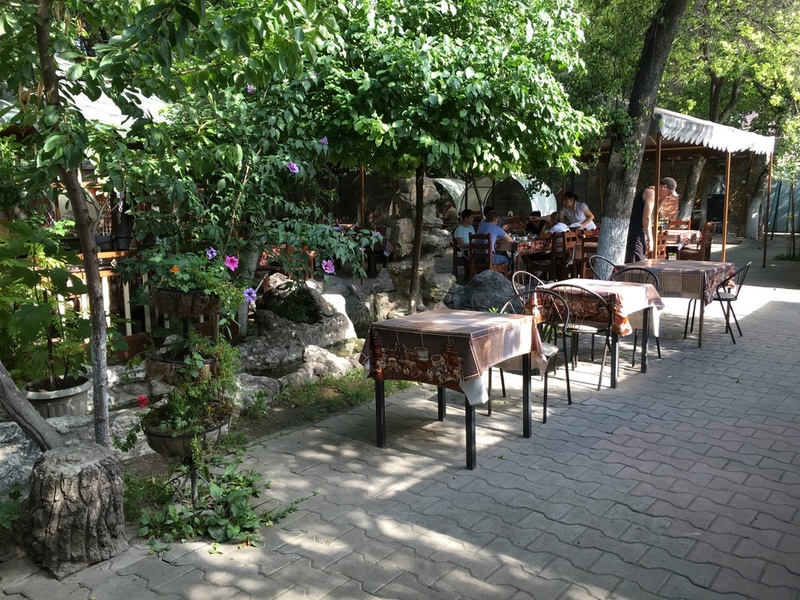 Head back towards the airport and find Nur Cafe [Кафе "Нур"] on a side street off of Mailina. Welcome to your first shashlychnaya [шашлычная], a restaurant specializing in shashlyk kebabs cooked on a mangal barbecue. There's a verdant patio hidden behind the restaurant where you can wash your skewered mutton down with beer or yogurty airan. There are no English menus, so come prepared with a Russian phrasebook or charm the curt waitresses with your shameless gesticulation. Enjoy your meal and make it back to your flight in time. You can now say you've seen a slice of Kazakhstan, all without leaving Airport Village. If you do want to explore more, I've made a map marked with other historical buildings, cafes, hotels, and points of interest. Click on the icons to see photos, or just forget it - go out and take some photos yourself!